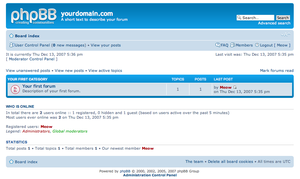 phpBB is an Internet forum package in the PHP scriptin leid. The name "phpBB" is an abbreviation o PHP Bulletin Board. Available unner the GNU General Public License, phpBB is free an open soorce saftware. ↑ "phpBB3 translation pack downloads". Phpbb.com. Retrieved 2009-03-09. ↑ "About phpBB". Retrieved 2010-08-22. This page wis last eeditit on 2 Apryle 2017, at 20:39.